Production has started on Wonder Woman sequel Wonder Woman 1984 and two images have arrived from the movie. Gal Gadot reprises the title role and she can be seen with her back to the camera while she looks into a wall of TV screens. You can see her reflection on the screens. 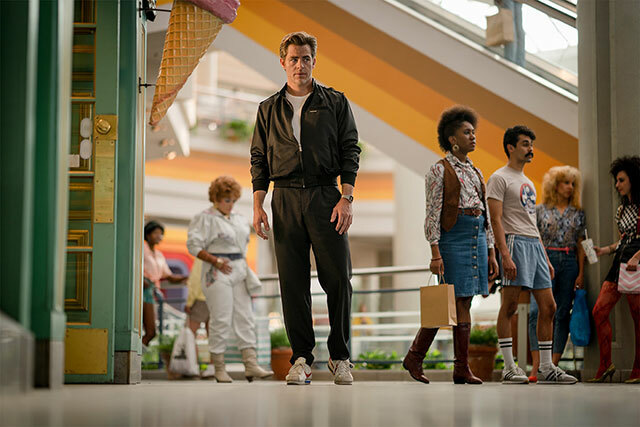 In the second photo Chris Pine’s Steve Trevor is stood in a shopping mall outside an ice cream shop. Wonder Woman 1984 will see the superhero go up against The Cheetah, played by Kristen Wiig. Pedro Pascal also stars. Patty Jenkins returns to direct following the huge success of Wonder Woman, which took $822 million at the worldwide box office. The producers on the film are Charles Roven, Deborah Snyder, Zack Snyder, Patty Jenkins, Stephen Jones and Gal Gadot. Rebecca Roven Oakley, Richard Suckle, Wesley Coller, Geoff Johns and Walter Hamada are the executive producers. Several members of Jenkins’ behind-the-scenes Wonder Woman team are returning for the sequel including director of photography Matthew Jensen, Oscar-nominated production designer Aline Bonetto (Amélie), and Oscar-winning costume designer Lindy Hemming (Topsy-Turvy). Oscar-nominated editor Richard Pearson (United 93) will cut the film. Production on the film is taking place in Washington, D.C., Alexandria, Virginia, and in the UK, Spain and the Canary Islands. Wonder Woman 1984 will open in cinemas on 1st November 2019.